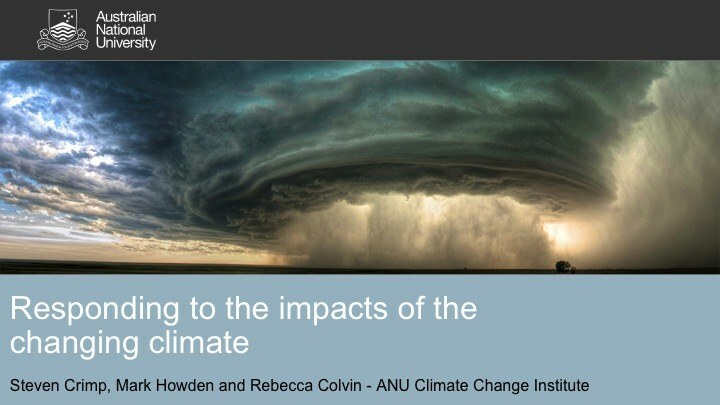 Steven Crimp from the ANU Climate Change Institute gave a presentation to Bowning-Bookham Landcare Group in June 2018, about responding to the impacts of the changing climate on our local area. Our local climate will get hotter, more volatile or unpredictable and probably drier (10 out of 12 climate models indicate drier and 2 out of 12 indicate wetter), with Bookham in 2030 more like Gilgandra, Narrandera, Parkes, Forbes, Leeton, Griffith, and West Wyalong; then by 2050 Bookham is expected to be more like Cobar, Condobolin, Forbes. The discussion among members then focussed on how to improve soil and especially moisture retention to improve the resilience of our farms and that cropping in our district is unlikely to succeed due to different soils to the areas mentioned above. The Bowning-Bookham Landcare group won an Environmental Trust grant Burrinjuck to Bango Habitat Hops and are sponsoring a workshop with Nola Hancock and Linda Broadhurst to assist nursery operators in the Yass Area Network (landcare groups in the Yass area) to identify native plants that will continue to thrive in a changing climate. Note: this workshop was scheduled for August but has been postponed... details to come.